On 02/14/2016 a beehive theft was reported at Kamm Avenue and Clovis Avenue in Fresno County. The owner of the bees said 20 wooden pallets that contained 80 hives were stolen. The hives were said to be painted white and light blue, with word “Marquette” branded on some of the boxes. The beehives had a total value of $20,000. Thanks to our active members, the CSBA was well represented at the annual Almond Conference. 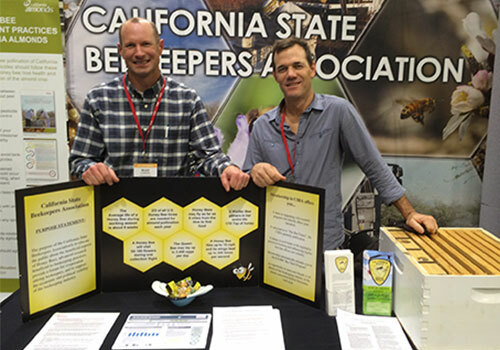 Participation at the Almond Conference is important for facilitating communication between beekeepers and almond growers. Our industries work closely together and it is important we understand each other’s needs and current issues. This year, the CSBA recognized several members who have made special contributions to our industry. These committed members have volunteered their time and energy towards improving our organization and promoting the interests of beekeepers. You can read more about each award recipient in the December issue of the CSBA newsletter, the Bee Times.